Environmental racism proliferates throughout the climate change continuum from who is most likely to be exposed to the co-pollutants from facilities that spew the greenhouse gas emissions that cause climate change, to who is most likely to be displaced or even killed from climate change induced disasters. The depth of the systemic inequities require a transformative response to ensure that civil, human, and earth rights are upheld. A book sale and signing will follow the program. The program is sponsored by the Clarke Forum for Contemporary Issues and co-sponsored by the Popel Shaw Center for Race & Ethnicity, the Churchill Fund, the departments of American studies, sociology, Africana studies, the program in policy studies, the Women’s & Gender Resource Center, the Alliance for Aquatic Resource Monitoring (ALLARM), and the Center for Sustainability Education. This program was initiated by the Clarke Forum’s Student Project Managers and it is also part of the Clarke Forum’s Leadership in an Age of Uncertainty Series. Jacqueline Patterson is the director of the NAACP Environmental and Climate Justice Program. 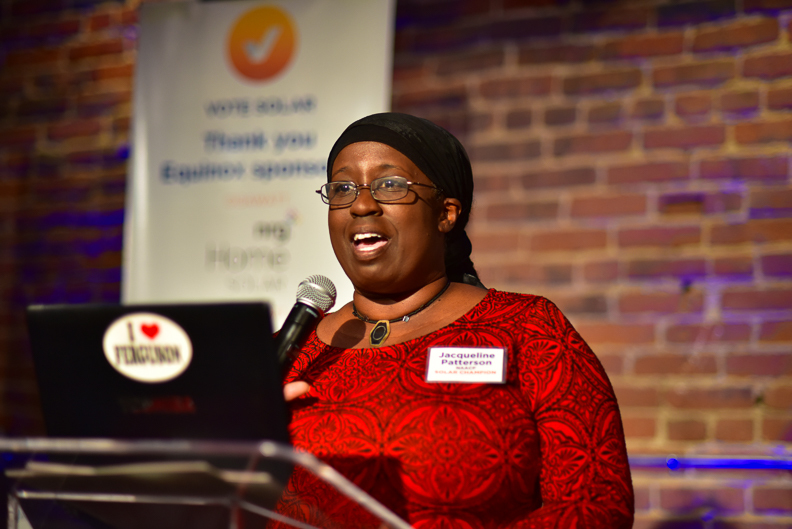 Since 2007 Patterson has served as coordinator & co-founder of Women of Color United. 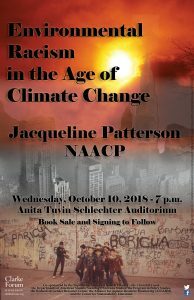 Patterson has worked as a researcher, program manager, coordinator, advocate and activist working on women’s rights, violence against women, HIV&AIDS, racial justice, economic justice, emergency response, and environmental and climate justice. Patterson served as a senior women’s rights policy analyst for ActionAid, assistant vice-president of HIV/AIDS Programs for IMA World Health, outreach project associate for the Center on Budget and Policy Priorities, research coordinator for Johns Hopkins University, and as a U.S. Peace Corps volunteer in Jamaica, West Indies. Patterson’s publications/articles include: “Equity in Resilience Building for Climate Adaptation: An Indicators Document” “Jobs vs. Health: An Unnecessary Dilemma,” “Climate Change is a Civil Rights Issue,” “Gulf Oil Drilling Disaster: Gendered Layers of Impact,” “Disasters, Climate Change Uproot Women of Color,” “And the People Shall Lead: Centralizing Frontline Community Leadership in the Movement Towards a Sustainable Planet,” and book chapter, “Equity in Disasters: Civil and Human Rights Challenges in the Context of Emergency Events” in the book Building Community Resilience Post-Disaster. Patterson holds a master’s degree in social work from the University of Maryland and a master’s degree in public health from Johns Hopkins University. 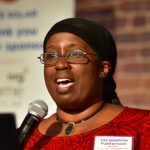 She currently serves on the steering committee for Interfaith Moral Action on Climate, advisory board for Center for Earth Ethics as well as on the boards of directors for the Institute of the Black World, Center for Story Based Strategy, GRID Alternatives, Center for Sustainable Climate Solutions, and the National Black Workers Center.